Today I did something totally irrational. I bought a cookbook (I generally never read such things again after flicking through a few times), and queued for two hours to see the author. 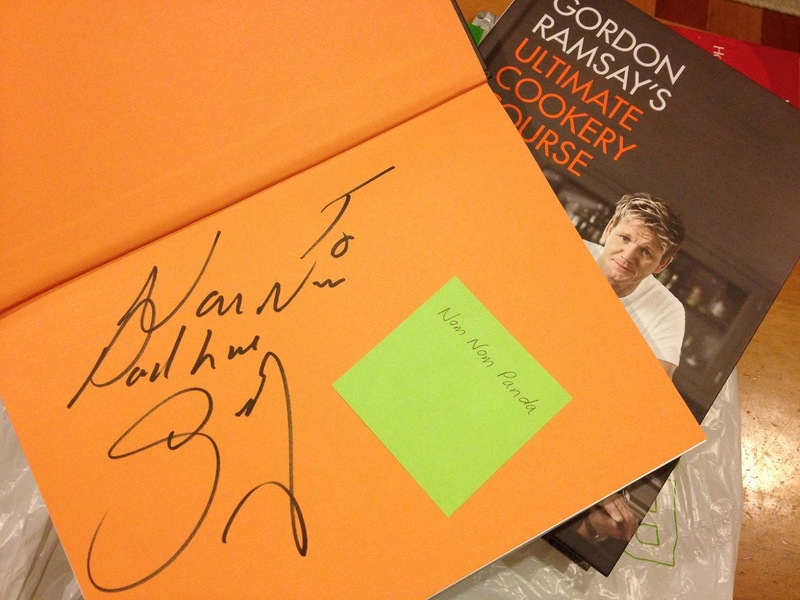 That's right, Gordon Ramsey is in town. Gordon at his book signing at Paper Plus Newmarket today. People usually associate the man with swearing and abuse, but I have really only watched Kitchen Nightmares and found him to be genuine and helpful to restaurant owners in distress. And he is just spot on with his advice. With the title of his latest book being "Ultimate Cookery Course" (which sounded like I would learn something rather than just getting a book of recipes), the promise of a signature from the celebrity, and the chance to win a fancy dinner cooked by the man himself, I absconded from work to wait in line. Finally got to Broadway after over an hour of queuing! And what a wait that was! The security guards at the entrance to the shop suggested that I buy a book first, so I went into the store and made my way to the counter, before joining the queue for signings. It was only afterwards that I realised I could have joined the queue immediately, because there was a man there with a mobile Eftpos machine, carting a stack of the books around! Although the signing session was supposed to be from 12 to 1pm, there was little movement in the queue until the celebrity chef presumably turned up at 12:50pm. Twenty minutes later, I made it onto Broadway (the queue went from this street around the corner), and began to hope I would get my turn soon. At 1:30pm, someone from the ZM radio station announced the winners of the dinner with Gordon, and ten minutes later I was inside! Queuing inside Paper Plus Newmarket. At 1:50pm, just as I was getting close to the table, the queue was suddenly cut off in front of me. Gordon's signing hour was up, and everyone behind the arbitrary position would have to leave. We were naturally outraged! What? You tell us this after we have waited two hours already? And spent $50 on his book (or $100 in my case, as I got an extra one as a gift)? After having been videoed waiting in line, and advertised to by opportunistic promo girls? I refused to leave, and watched as the last of the lucky ones made it to the table. Gordon, perhaps unaware of the situation, chatted cheerfully to each person, asking one about their studies, noticing another was their friend. As soon as he was done, those of us behind the cut-off mark who did not already leave in disgust cried out for him to sign our books also. He laughed and agreed, while the book store staff laid down the rules: no messages, no photos, just signatures and out the door. It was an expensive price to pay for an illegible scrawl, but, well, I got my prize!